Ice cold in Attadale 28th Feb 2013. The wind turbines at the side of the M74 had no Glaswegian Don Quixote challenging them tae a “square go” as we sped past them on our way north, instead they revolved slowly and majestically in the negligable breeze of the huge anti cyclonic weather system that was squatting over the north of the UK. I am of two minds about these objects, I think they look great but I hear that they take more energy to make than they ever produce in their life time, kill birds and blight the landscape. I must educate myself about some of these facts, tis true the access roads that they put in to service the turbines create an awful mess but come the tipping point of carbon dioxide in the atmosphere I think that the NIMBY’s that shouted loudest about these abhorrent sculptures may have more to worry about, if they are still alive of course. However, we were on our way to Attadale, a remote area in north west Scotland to indulge my passion for ticking munros (hills over 3000ft of which there are approx 280). The hugh cyclonic weather system already mentioned was bringing some cold and clear weather to the north west and we were keen to take advantage given the awful weather we had experienced on our last Scottish trip at the end of January. By 1730 we were parked up at Craig and walking in with the setting sun in our backs towards Glenuaig where we had decided to camp up to give us access to the seven hills in this area. There is a hostel at Craig called Gerry’s but after being called a softie for even contemplating using it we decided to go for the wild camping wilderness experience ( take note Mr Cairngorm Wanderer ). As soon as I saw the place we had decided to camp I knew it was going to be cold, it was a big bowl shaped glen surrounded by hills that was just going to fill up with cold air. We lost no time, pitched the tents and fetched some water from the river to cook with, by the time the pot was placed on the stove the water in it was covered in ice, less than a minute and it was freezing. Twas a cold night, when we woke in the morning there was a hoar frost inside the tent, however I will not regale you of our suffering for fear of being branded a southern softie, we got up and got on with our targeted hills for the day. Crossing the river via a twin wire bridge provided an exciting start to the day and as we climbed higher the views that greeted us simply took our breath away. The whole mountain panorama of Scotland’s west coast was laid out before us. The snow was hard and icy, the air was crystal clear but a bitter wind across the tops kept us moving over Sgurr Choinnich and onto Sgurr a’Chaorachain from where we dropped back down into the glen to hide in our tents, after a hastily prepared three course meal, from the rapidly lowering temperatures. That night I estimate it was about -15, the river froze, my boots froze but we were warm as toast in our downy bags. 0700 saw a very reluctant unzipping of the bag and a very rapid donning of thermals, once lit the heat from the stove melted the frost on the inside of the tent which meant a cold shower for those more reluctant to get up first. However coffee and porridge partaken of we were on our way via the good stalkers path to the summit of Sgurr nan Ceannaichean by 0830. Again it was a day of superlatives, a wee bit more haze in the air but a warmer air flow meant that a lightweight fleece provided enough warmth to stop and admire the view, and what a view. We cruised over onto Moruisg and then back down to Glenuaig Lodge to lunch in the sun at 1400. What to do now ? Maoile Lunndaigh was sitting just on the other side of the glen, however cloud was starting to drift in and obscure the hills we had just crossed. No time to waste then Choire and I decided to go for it, Jane decided to head on back to the tent some 5Km down the glen. We had a good look at the hill and decided to take a direct line up the north west spur via a steepish snow filled gully. One hour and twenty mins later we were on the summit plateau in lovely sunshine full of the joys heading for cairn, which was still over 1k away. Next minute we were shrouded in cloud with about 10m visibility, we pushed on. After about 5 mins we came to a cairn, took a compass bearing from it and started walking, no sooner had I taken the bearing we were in a white out the likes of which I have never experienced. It was like being inside a white light bulb, the sun was shining into the cloud and the snow on the ground was bouncing the light all over the place. I slowed my pace and kept going, then right under my foot I saw a cornice fracture line, two more steps and I would have been over it. We retraced our steps to the cairn and deduced we were on the summit of Carn nan Fiachan and not at the edge of mica ridge where there was a cairn marked on the map. My mistake, but almost a very costly one, shaken and full of doubt now I decided to retrace our steps and not risk the narrow ridge bounded by big cornices in-between us and the summit proper, after all there is less than 10m of a difference in height from where we were and the actual summit. The retreat from the summit plateau proved just as epic involving a 150m, 60 degree down climb on hard neve and by the time we made the floor of the glen it was dark. The lighted tent with a hot cup of coffee steaming away ( thanks to Jane and her early return) was a very welcome sight as Choire and I got back an hour later. It was the sleep of the profoundly happy to be alive that night, the clag had brought the temperatures up and in the morning the frost had been replaced by drizzle. Hey Ho, we packed up and walked out, five out of seven ticked, two halcyon days and scaring myself silly into the bargain. How to do something special for the one you love on Valentine’s day. 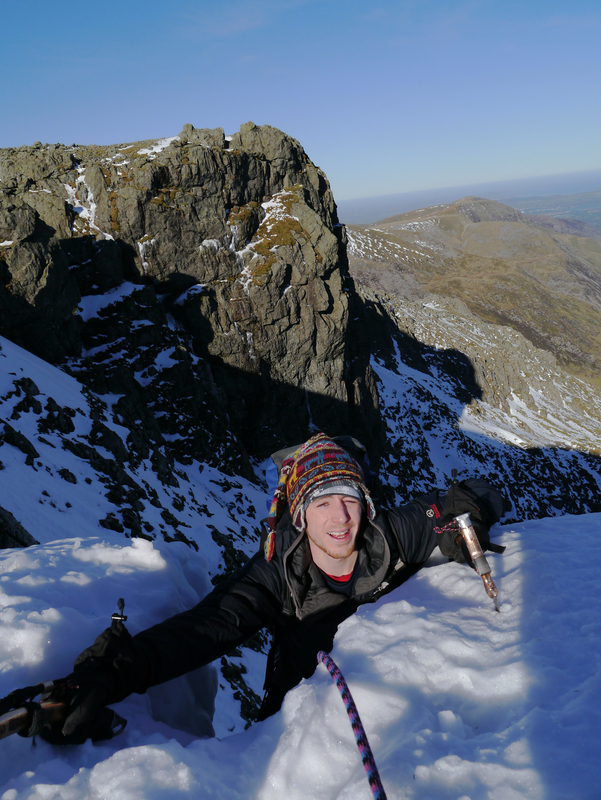 Choire nears the end of Crib Goch. What? 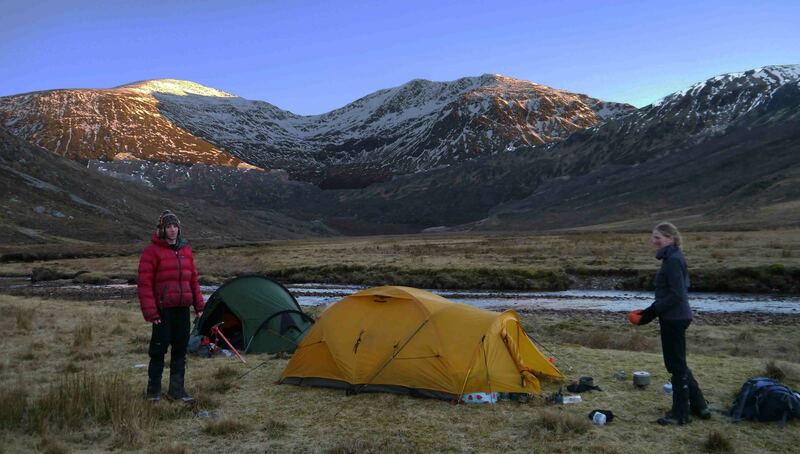 Take them camping to Snowdonia of course. Never say that I am not an incurable romantic, I even packed a hot water bottle for Jane’s sleeping bag. Ahhhhhhhh I here you say, what a softie. Why do I go to such an effort to please? Well it’s not completely altruistic, I have to admit. 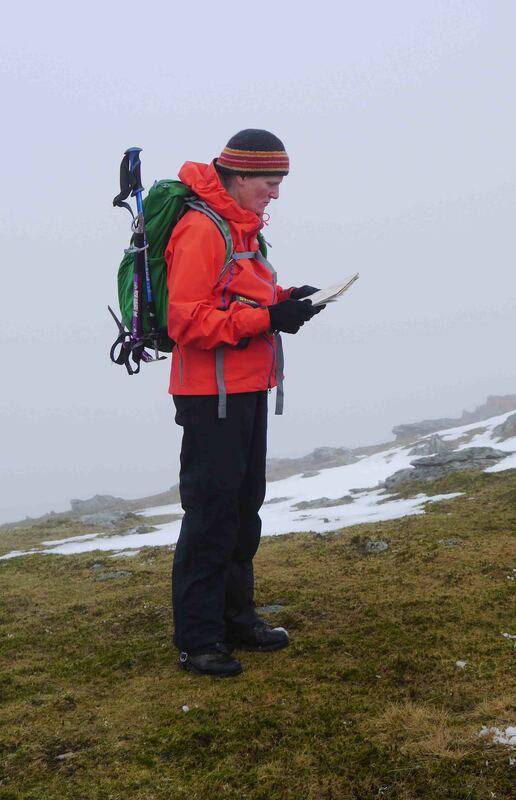 The DofE season is almost upon us and we need to get out there, make sure we are fit, all our kit is up to the job and that our skills as navigators in poor conditions are sharp and capable. We take this very seriously here at WCC, how can we teach and be responsible if we let our core competencies slacken off. Soooooo, it was with this in mind that we packed the tent and headed up to Llanberis on Thursday 14th Feb. We were hoping for some good low visibility in order to test our compass skills, and nature was kind to us on the Friday with cloud down to approx 500m and no rain ~ marvelous. We navigated our way out of Ynys Ettis looking for obscure ring contours and the like. Our route mysteriously led us up onto Gyrn Las and the summit plateau of Crib y Driscol where we found clearing skies and way more icy/snowy conditions than we had anticipated. At the summit it was clear that nature had not intended for us to be challenged all day on our map and compass skills but had instead rewarded us for our industriousness and provided us with the opportunity to have a bit of fun as well. A snow covered Crib Goch came tantalisingly in and out of view through wispy clouds ~ no contest then. While Jane opted for a descent to Llanberis, Choire and I shot off along the snowy ridge like pigs in proverbial. Fabulous conditions, nice “firmish” snow, clouds coming and going and a starting time of 1400hrs meant that we had the majority of the ridge to ourselves. Some of those we did see were woefully ill equipped for the conditions; one guy in trainers heading south (with all the height gain in front of him) asked us: “Is it any icier up there?” as we passed him equipped with ice axes and winter boots etc etc. What a numpty! probably an improvement to the gene pool if he fell off, but the problem is then given to those who have to go and pick up the pieces. There was nothing we could do, the drop off at the half way stage was steep and snow covered and not an option and he was well over half way. We pointed him in the direction of the tourist path to Llanberis at the end of the ridge and continued on our way. By 15:30 we were on Crib Goch itself and 5:30 saw me down in Llanberis to pick up Jane who was very comfortably settled in Pete’s Eats !!!! Next day we headed out to the Molwyns ~ the navigators graveyard. The cloud was down, light rain blowing through on the wind, fresh but not too cold. Just enough to ensure that constant movement was required; a great day to be out to challenge our map skills, and that is what we did for over seven hours. We looked (and generally found) re-entrants, ring contours, small llyns, spurs, river junctions etc etc etc. It is a really comforting feeling to be out and able to navigate in really challenging conditions. Sunday we awoke to lovely blue skies. Brilliant!!! We had navigated, through some foul conditions, had a great wintery ridge day out and so we decided that we should be rewarded for our efforts. A day’s climbing at Tremadog was clearly in order. It was not to be tho; after unloading the car boot I discovered that my 50m half ropes were not there. Oh bother (as you can imagine that is not really what I said). So instead we headed back up the hills into the Glyders. The sun shone, the wind whistled, the punters were few and we filled our souls with the emptiness of a lovely winter’s day in the mountains. We were supposed to return to Somerset that night, after all you can only spoil a girl so much, but given the weather (and the lovely snow conditions) (and the fact that I had spotted a nice steep snowy gully line in the nameless Cwm) I convinced Jane to spend yet another night in the luxury of our five star North Face penthouse. Next morning, early doors Choire and I stomped our way into the cwm and onto the line that I had spotted. Slightly disappointingly the line was not as steep as it had looked and turned out to be around grade 2(ish). However a great wee time was had and we back at the CC Hut in Llanberis by 13:30hrs to rescue Jane (who had knocked down the tent and tidied everything up, and even had our lunch ready (it’s amazing how people respond to being spoiled). What can you say!? !… I bet your husband/boyfriend/partner never spoilt you like that. The only problem is coming up with something even better for next year. Any suggestions? A consolation Munro Scotland 31st Jan 2013. 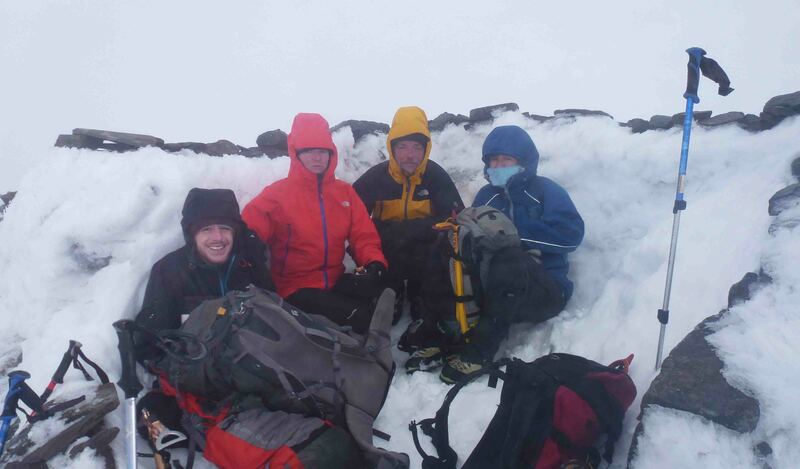 Sheltering in the summit houff, don’ t we look happy ? Statistically, if you are driving down the fast lane on either the M74, M5 or the M6 overtaking some slower moving traffic whilst maintaining about 80mph and headlights appear 6 feet away from your rear bumper then it is probably a BMW X5. We proved this by identifying the type of car each time we were bullied out of the way by an overly aggressive driver. Why this should be I do not know. Perhaps when you buy an X5 you have to prove you do not have any courtesy to your fellow drivers. If you own one and are not like this then sorry, but you are in the minority. Anyway… After being harassed and bullied by X5s we arrived in Fort William late on Saturday night. The weather in the few days preceding our arrival had been nice and clear and cold. My friends had been posting pictures of their various icy exploits on facebook making me envious, so with high expectations we unloaded all the kit we had packed some 10 hours earlier for various wintery activities into the cottage and fired up the computer to check the forecast. Oh dear, the forecast for the Sunday was not very good. Rain, rain and more rain with rising temperatures and gusty wind. No matter, we were tired from our long drive and a lie-in would not go amiss anyway. The rest of the week looked dubious as well but you can never tell, If you went by the forecast you would spend most of your time in bed. 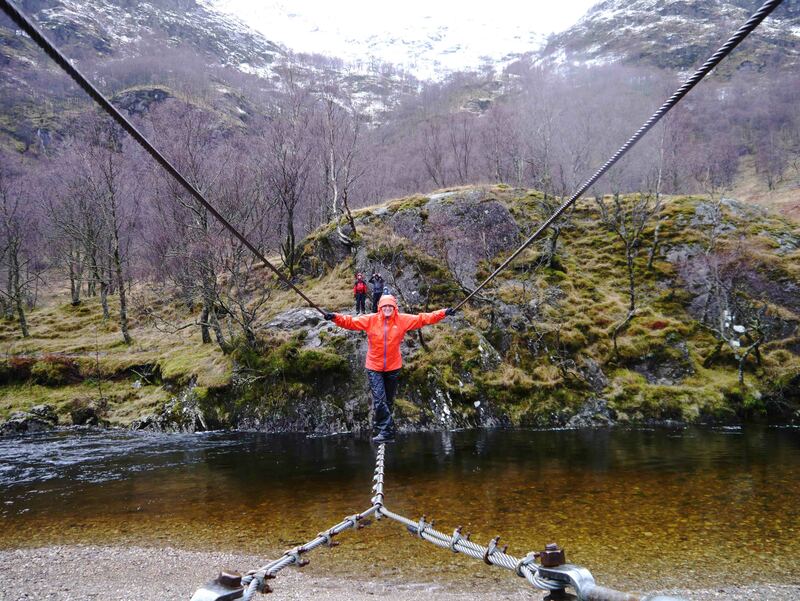 So next day, after a leisurely start we had a walk up Glen Nevis to the Steall Hut, crossed the wire bridge then back again and went a way further up the Glen. The weather was awful: heavy rain, mighty windy and by the time we got back to the car we were all pretty soaked. Hey ho! At least we had got out. Monday was even worse, so we went to the Kinlochleven climbing wall and thrashed ourselves on plastic whilst watching the torrential rain outside as it stripped the snow from the hills. By that evening frustration was mounting along with the determination to at least go out and try something. The forecast however was far from inspiring – it promised rain and snow driven by 100mph gusts hmmmmm. However stupidity and frustration saw us on the 07:40 from the Bill to Corrour in the middle of Rannoch Moor with an ascent of Beinn la Lap in our sights. Classed as one of the easiest ascents of all the Munros (once you get to Corrour station that is, which is quite a long way away from any roads) there is only 500m to climb with just over three km to get to the summit. Luck was with us. Well kind of – it wasn’t raining. 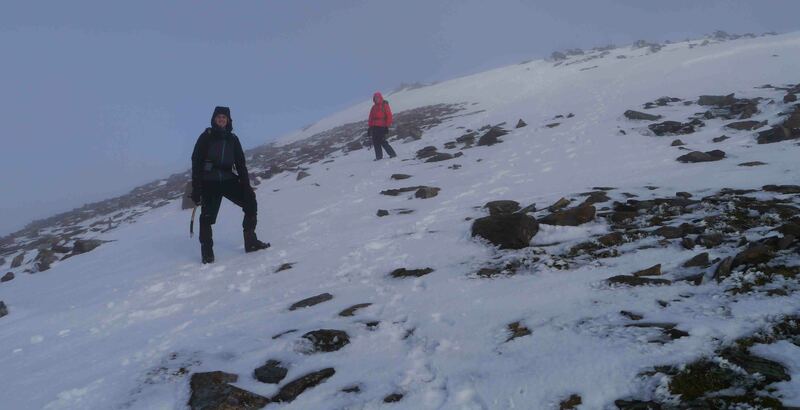 However, the first bit of the ascent was through deep soft slushy snow… By the time we reached the gentle ridge we were sweating with the effort of two steps forward one slither back, the cloud was down to 700m and so the last 40 minutes was reduced to very poor visability. However, two hours after leaving the station we were sheltering from the rising wind and hail in a scant houff on the summit. A bit of chocolate scoffed we started our descent. The wind however was having other ideas. It was now really blowing. The hail stung our faces – ouchy!! The fierce gusting wind robbed our lungs, tried to lift us off our feet, and reduced our fingers and faces to blunt objects with no feeling whatsoever. Thankfully we were able to drop off the main ridge into some snow filled gullies, where we got a bit of shelter from the hooligan gusts and made rapid progress back towards Loch Ossian. We were back down by 1200 and still had 3 and a half hours before the train was due to pick us up. We decided to have a brisk walk around Loch Ossian, a mere 13K. The eastward journey was fine but the westward one, on the south side of the loch offered the idea of maybe having made a big mistake. Firstly the track had not been cleared of snow; secondly the snow had turned to a minimum 6 inches of slush; thirdly the rain was now torrential and being driven into our faces by sadistic winds; lastly we were tired and had a train to catch (the next one would mean a six hour wait). We made it (just) and sat and steamed our way back to the bill, weary but strangely satisfied, we had accomplished something against all the odds. Next day, despite tired legs and still wet waterproofs, we decided to have a low level circuit of the Grey Corries. It was not to be: by the time we reached the coll above Spean Bridge underneath the grey corries we were getting a severe kicking from the wind. I would guess gusts at 60 or 70mph stopped us dead ( generally blew Jane over) and threatened to push us into the river. It took us three hours to reach the bothy under Stob Ban, which is only one third of the way around our chosen route. On the way up to the Bothy. We decided to run away, which was a very wise decision as the weather only got worse and worse. So that was it coz the next day we decided enough was enough and went home. You could count this as a waste of time, a failure to get anything hard done, but I wouldn’t. True we never got on any steep ice, I never ticked any of the more challenging hills I had on my hit list but we got out most days, got up a hill and felt strangely satisfied by achieving anything at all. Most importantly we really enjoyed the experience, just being out in the hills in wild weather is enough sometimes. But lets hope its colder and calmer next time. It had been 10 days since we had come back from the heat and humidity of Thailand, ten days of processing a five week backlog of paperwork and admin and righting what entropy had done to my house whilst we had been away. Ten days and I was feeling cooped up and going just a wee bit stir crazy, its terrible when, as nice and comfortable as my house is, ten days is enough to be in it without a break to the hills or rock faces wherever they are. Choire tries to find a bit of shelter underneath one of the rock sections at the bottom of the gully. Conditions had been far from ideal but it had been getting colder, I also had worked booked into my calender on fairly sporadic days which kept me from venturing further afield ( Scotland or Snowdonia ). Then we had a dump of snow which resulted in the cancellation of some work which coincided with a cold spell so Choire and I bit the bullet and headed out towards the Brecon Beacons. 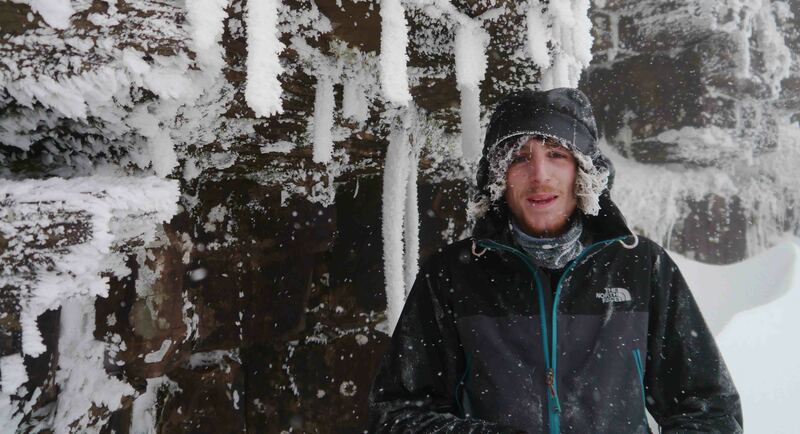 We headed up towards Pen-y-Fan with increasing optimism, it was cold ( -3 0r -4) there were big icicles hanging from the overhanging river banks at the back of the Storey Arms and a good covering of snow. We skipped over the summit of PyF in pea soup, headed down the north ridge and dropped down to the bottom of the north face. Right hand gully was in crap condition, unconsolidated powdery snow covered the boulders, however the rocks to the right of said gully had a good covering of ice in places and the steep rime covered turf in-between the rock bands was well frozen. The combination gave a consolation prize and a bit of fun. At least we got our crampons and axes out, did a bit of winter navigation and got a rough awakening as to how (hill) unfit we had become after 3 months of climbing in Kalymnos, Spain and Thailand. Lets hope now for a couple of months of good wintery hill weather to get us fit for the coming ( work) season and to save me from an excess of mind numbing office work.